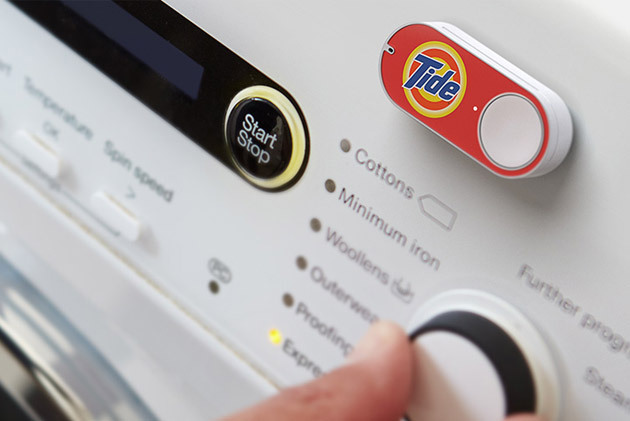 Amazon's Dash Button Lets You Re-order Everyday Stuff At The Press Of A Button | OhGizmo! Amazon is all about eliminating as much friction between top Amazon products, and them delivering it to your doorstep; the more seamless and unintrusive the process is, the more likely you are to make the company money. Their latest effort in that field is the Dash Button, which lets you re-order everyday household items by simply pressing the button on a little dongle. Offered by invitation only to Amazon Prime members, the button is setup through the Amazon app, and connects to your WiFi router. If you’re doing the laundry and you see you’re running low on detergent for example, simply press it; you’ll then be get a notification on your phone allowing you to either cancel, or continue your order. It’s a smart idea, and comes on the heels of a previous gadget, the Dash, which was a Wifi enabled barcode scanner. We’re not sure how popular that device became, but there’s a feeling Amazon is testing the waters with a lot of these things, and we wouldn’t be surprised if at least some of it eventually stuck as a normal, ubiquitous ordering mechanism amongst shoppers.